Jewel of Burma is a rhizomatous herb up to 3 ft tall. Rhizome is ovoid without branches. Roots are many, penetrating deeply into soil terminating with externally light brownish, hairless, white internally. Leafy shoot is 1-3 ft, pseudostem 15-25 cm long formed by leaf sheaths and a few sheathing bracts. The leaves are broadly ovate to elliptic, light green with darker veins, and up to 30 cm long. Inflorescence is always central. Flower-cluster-stalk is 15-28 cm, green, hairless, most of it hidden within the pseudostem. Flowers are borne in spikes about 8-15 x 4- 7 cm, cylindrical, consisting of 15-45 bracts arranged in 3-5 serial rows, Coma bracts are similar in colour and size to fertile bracts, sterile. 5-7, spirally arranged. 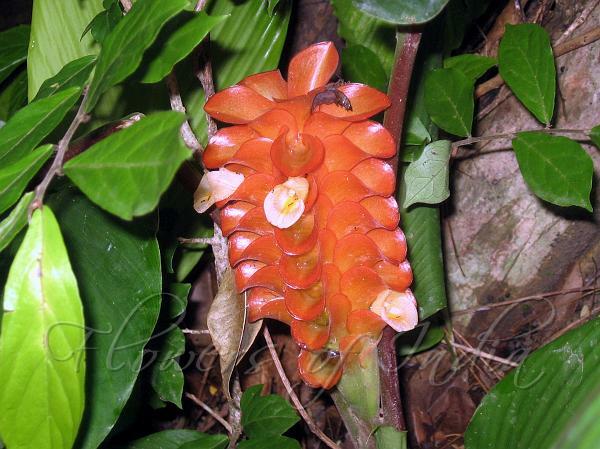 Fertile bracts obovate-spoon-shaped, about 3.5-4.5 x 2.5-3 cm, deep orange-red in upper part gradually becoming yellow-greenish at their base. Flowers are 4.5-5.5 cm long, cream-white with yellow in the centre of lip, slightly protruding from the bracts, calyx white; flower tube creamy white, lip creamy white with deep yellow patch in the centre. 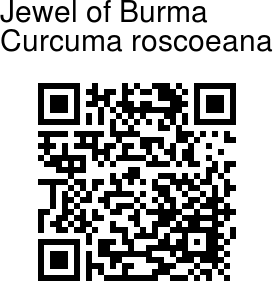 Jewel of Burma is found in Andaman Islands, Myanmar and Thailand. Identification credit: Joju P. Alappatt Photographed in Middle Andaman Island, Andaman & Nicobar Islands.